Hearing your dentist say you have a small cavity that needs to be filled is not good news. But it’s smart to take care of it right away rather than letting the decay go untreated, causing a bigger issue later on, like needing a root canal. Of course, properly maintaining your pearly whites will help you avoid the drill altogether. Logs absorb a lot of heat from the sun, but that absorption can be uneven. The upper log surfaces that face the sun will be hotter than the lower surfaces that face down. Logs move as they settle, dry and respond to structural stresses and fluctuating temperatures. Cracks, also known as checks, can open in logs as they move. These three factors must be addressed by your maintenance routine. The wood treatment you use should offer UV protection and be formulated for logs. Gaps that open between logs due to movement need to be sealed. And, wood exposed by cracking or checking should be protected with either a wood treatment or caulking to keep water and insects out. Water staining on tongue-and-groove porch ceilings. Plan to clear gutters if needed, and re-treat rafters as soon as possible. For roofing concerns, you may want to contact a professional who can safely repair any damage. Look closely at the log walls for cracks or checks that may appear as the logs age. Checking tends to happen more often in the first few years of a new home and becomes less frequent as the home ages. If you’ve spotted checks in the past, examine those areas, looking for further cracking. Cracks that measure more than a quarter-inch wide should be filled with elastic caulk made specifically for log and wood homes. In areas you’ve already caulked, check to be sure the caulk is sound, with no splits or gaps. If you find spots where the stain is flaking, or peeling, mark them with painter’s tape or take a photo for reference. As you review the logs, watch for mold or mildew, water staining, algae growth or soft wood that may indicate rot. Mark or photograph those spots, as well. Start by giving your log home a bath with a log cleaner to remove pollen, cobwebs and dust. It also will help reveal where stain may need to be replaced. If water no longer beads on the a log’s surface or there’s a change in color (usually darkening) between logs, it’s time to re-treat those areas. Keep in mind that walls with sunny western and southern exposures may require more frequent re-treatment. Walk around the house looking for new or widening checks. Take note of the condition of caulk or chinking. White, powdery stains on logs can be a sign of moisture infiltration. Look for insect activity or signs of infestation like holes in the logs and small piles of sawdust left behind from tunneling. With your seasonal inspection complete, it’s time to address any concerns you’ve found. Always start with clean, dry wood. For spots where caulk or chinking has split or pulled away from the logs, you should re-apply. When caulking large cracks or checks, insert caulk at the widest point to help maintain a tight seal and protect the log’s interior. Rot and insect infestations should be removed and the cause remedied. When caught early, rotted areas can almost always be fixed with wood putty or epoxies. A mildewcide can be added to stain to prevent mildew from spreading between treatments. To eradicate insects, apply topical pesticides or use borates on wood that isn’t stained or treated. Keep in mind that some boring insects present no real threat to the integrity of the logs, but the holes they make can hold water, which can lead to rot. Fill these holes with wood putty or caulk. In most cases, stain that’s in fairly good shape (with little peeling, flaking or fading) can simply be spot-treated. Follow product instructions closely. Weather conditions will affect when you can apply log treatments. Wait for several consecutive clear days when the temperature is not extremely hot or cold and the log walls or deck railings are dry. Avoid applying stain or sealants in direct sunlight. As you work, remember to record and photograph what you’ve done. This will allow you to easily monitor changes that might occur by the next season. 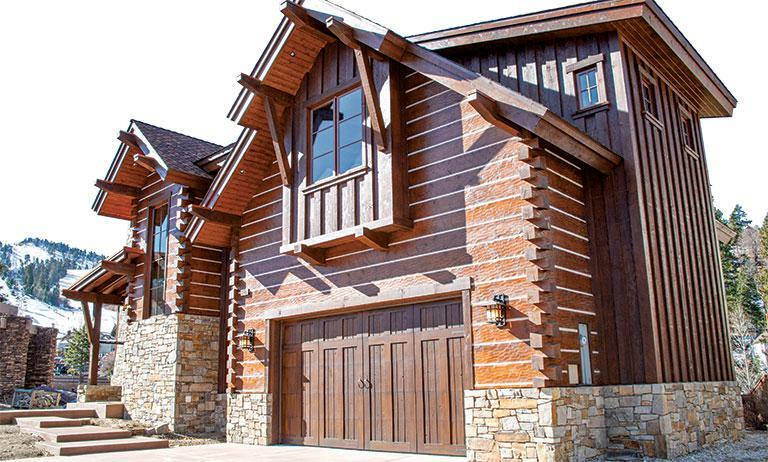 For more log home care info, download the full article here.